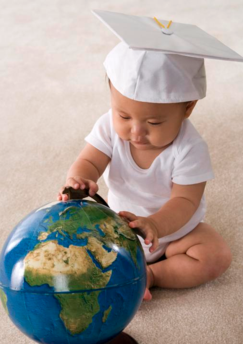 This is the time a baby establishes bonds and learns to adapt to the world. Our highly qualified staff ensures the baby develops to his full physical and cognitive potential, while fostering the concept of trust and safety outside of the home. Our curriculum is based on sensory learning, discovery, gross/fine motor skills, language, and understanding. The Infant Program does not have a fixed center directed schedule; it is based on individual staff and parent planning and scheduling for their child. Our infant classrooms are divided to help the babies through these important early developmental milestones. These are our younger babies. At this stage the staff ensures the baby develops to his full physical and cognitive potential, while having fun. Some of the milestones are: Rolling over, sitting on their own, crawling, standing up, and much more! These are our mobile infants. At this stage the staff ensures the classroom and activities are set up for exploration, cognitive development and fun. Some of the milestones are: Walking, sitting at a table, talking and much more! Priceless Moments' curriculum is a well-balanced, age appropriate curriculum of specific, planned learning experiences that support the social, emotional, physical, intellectual and language development of all children.